It is a credit to the quality of our Facebook and Twitter fans that so many take the time to write us with appreciation and praise. It is extremely meaningful for us to receive your feedback, positive or negative, but we are especially motivated and thrilled to learn when we are satisfying our customers. Here are some examples of messages we have received lately on social media. Thanks to all who have written to us. 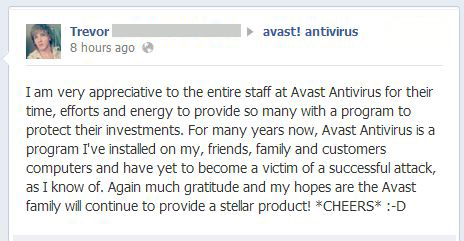 We invite all our avast! users to join us on Facebook and Twitter.